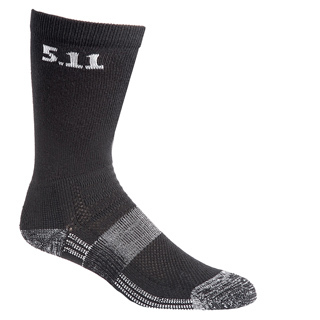 5.11 Taclite™ 6' Socks incorporate multiple compression zones that work in tandem with 5.11®s Shock Mitigation System®, and are designed to be lightweight and utilize kinetic absorption to improve your stamina, speed, and control. Heel and toe reinforcements enhance durability, and moisture-wicking fibers keep you dry. Excellent warm-weather socks for all-day comfort and peak performance. A worthy investment for desk duty, tactical deployment, and casual weekend wear.